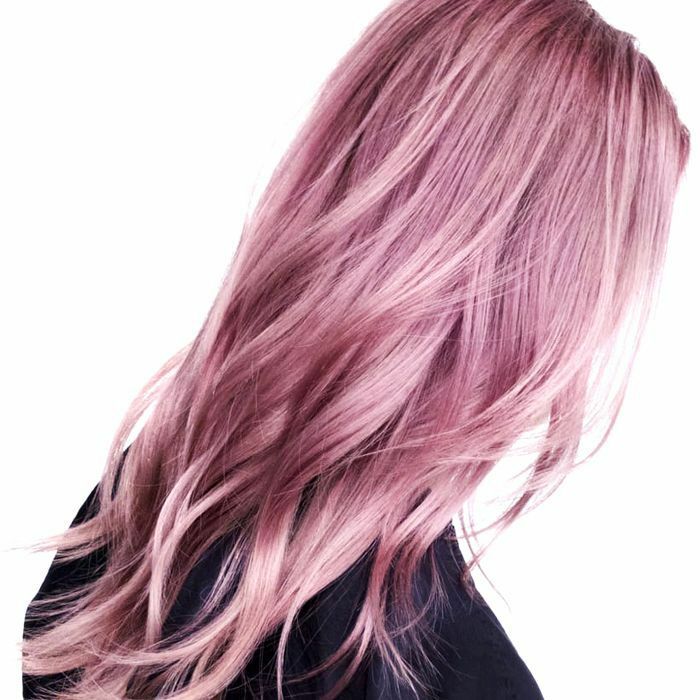 Just when we thought we had seen every variation of pink hair (rose gold, millennial pink, pink champagne), we're met with a new member of the blush family. Enter "dusty rose." Unlike its brighter, more playful counterparts, this hue has ashy undertones, but it has the same highly coveted level of searchability that has us spending more time on Pinterest than a bride-to-be. It's one thing to fawn over a board dedicated to this vintage take on pink, but it's a whole separate level to take the plunge and get the hue yourself. We spoke with Stephanie Brown, colorist at Nunzio Saviano Salon in New York City, for everything you'll need to know about summer's hottest shade. Keep reading to find out what the color, the process, and the aftercare will entail. Getting a perfect blend of the heathered hue is the same process as if you were dying your hair brond: there are brighter shades, darker shades, highlights, lowlights—all the details that factor into the final color. "Champagne pink and rose gold are warmer pinks," Brown explains, adding, "dusty rose is an ashier pink and is also a little more intense—almost like a velvety look where rose gold has a more sheer look." Blondes, redheads, brunettes, and black hair can all dabble in the hue: "You can have any base color," Brown tells us, though she personally thinks a light base gives way to the optimal dusty rose hue. "The hair needs to be pre-lightened to a pale yellow to white, otherwise this color won't show up too well," Brown explains. "The darkest you can have for it to show up a little would probably be a level seven to eight medium to dark blond." Depending on how dark your hair is, this will be a discussion to have with your stylist before they begin. However, like the photo above, you can also opt for more of a tint against a dark base—this way, you're not committing to a full head of bleach. "To achieve this color, I like to mix a pastel pink and pastel purple or pastel blue," Brown explains. "The good thing about these colors is they are straight pigments so you can see what the color will look like before applying it to the hair. Pravana color is great and Schwarzkopf has a dusty rose already made for you. But you can use almost any brand you like. At home for myself, I love using the Overtone conditioners." She also recommends Manic Panic if you're going the DIY route. "It's simple to use if doing it at home by yourself." The only problem is it will read more pale pink than the "dusty" hue, as it doesn't have gray undertones, so if you want more of a vintage pink, it's best to visit a professional. The aftercare is usually the toughest part about major dye jobs, and Brown confirmed our suspicions. "With creative colors like this, it usually needs to be touched up often. That's why at-home maintenance is important if you want the color to stay." Fortunately, she had some helpful tips for preserving the color: "Don't shampoo too much, and only use shampoo for color-treated hair. And again, Overtone conditioners are great for at-home maintenance. They have several colors for you to choose from, and they condition hair, which can sometimes be damaged from lifting hair to very pale shades of blond." There's a silver lining to all of this, though: Any time you're dyeing your hair a certain color, you want to ensure it fades nicely, which is often the case with dusty rose. Brown explains, "This color—and pinks in general—fades well, at least in my own personal experience. Even if it's uneven, it's soft enough that no one can tell, and they just see pretty pink pieces in your hair." For more mane inspiration, check out the summer hairstyles every celeb is wearing.